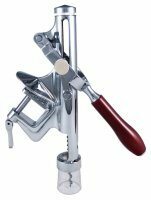 There are a variety of different wine corkscrews and wine bottle openers on the market but they basically all do the same thing – pop the cork out of that wine bottle so you can enjoy the goodness inside. “Here’s to the corkscrew – a useful key to unlock the storehouse of wit, the treasury of laughter, the front door of fellowship, and the gate of pleasant folly. – W.E.P. 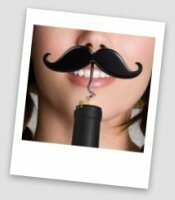 FrenchWhen choosing the right wine corkscrews (CLICK HERE to see this product in our barstore), consider what kind of an environment you will be using it in. Start by answering these questions: Do you drink wine regularly and it’s just for home personal use? Do you find some models awkward and hard to handle? Will it be used regularly at the club / bar / pub or restaurant you work at? Is it for your home bar? Below is an outline of the different types of wine bottle openers that we sell. You will find almost every kind in our bar store. 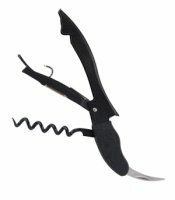 Most people in their homes use a winged corkscrew like in the picture above; most waitress and bartenders use the folding style so that they can keep it safely in their aprons or pockets. Plus there is a touch of professionalism when your server pulls out of their apron a good looking, and effective wine corkscrew. From personal experience, we like to use the double lever corkscrews. They allow more control over the bottle’s cork while pulling it out. These three all offer the same functionality but are different in style and size. 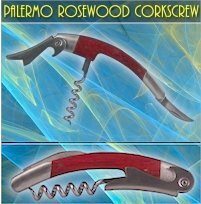 The Palermo, Tuscan, and Napoli wine corkscrews all feature rosewood handles, the rest are made of stainless steel. The knife is serrated and the lever is a short ‘boot’ style. The spiral corkscrew is teflon coated and heavy duty. So even those hard to pull corks won’t stand a chance against the Palermo, Tuscan, and Napoli. When folded they are designed slim for easy storage in your pants, pocket, or apron. This corkscrew has a unique system with a push in double lever. It’s teflon coated and the handle is made of ABS Plastic for a good grip. It’s got a steel serrated knife and the whole thing measures 5 inches closed. 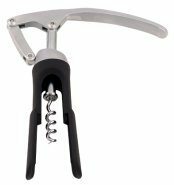 This corkscrew might look more like a camping tool, but it is well designed and easy to use. The spiral and serrated knife are made from stainless steel. The body has a soft grip plastic to protect your hands if you’re opening a lot of bottles. The best feature of this corkscrew is the double or 2-step lever. It allows you to use the first step and pull the cork out about 3/4 of the way. The second step allows you to control the last 1/4 out of the bottle so you avoid that unprofessional ‘POP!’ sound. It also requires less strength as you are not pulling the last quarter of the way. This unique corkscrew has a safe knifeless design. The razor has a spring action that wraps around the neck of the bottle and slices the foil off clean and even. It’s fast, safe, and easy to use. 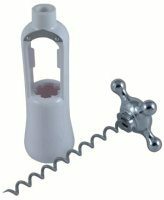 It also has the handy 2 stage lever system to make pulling the cork out of the bottle easier and cleaner. 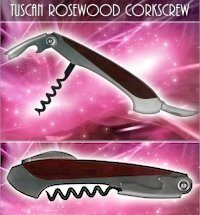 The Trieste wine corkscrew is perhaps the most commonly used corkscrew on the market today. 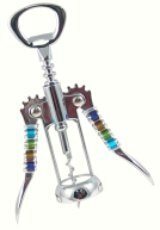 Most waiters and bartenders own a sleek, stainless steel corkscrew just like this one. 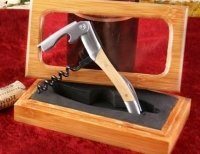 It’s heavy duty, folds up to 4 1/4 inches in your pocket or apron and looks nice opening a bottle of wine. 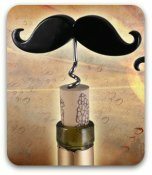 If you’re looking for gifts to give, these beautiful corkscrews come in cases and make a great gift for your wino neighbor or your daughter’s bartender boyfriend. Rosewood case with a velvet lining, this beautifully crafted corkscrew has a stainless steel serrated knife and spiral with a wood handle. Features a ‘boot’ style lever. ‘boot’ lever. The box is made of 100% Bamboo and Velvet. 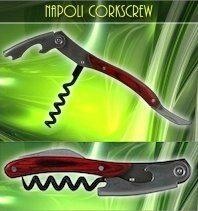 The Big Ear corkscrew is an old fashioned style corkscrew with a modern look. Designed like a wind-up toy, it is easy to grip and wind into the cork. This set even comes with a stopper to keep any unfinished bottles fresh.